North Lake Leelenau Retreat! Beautiful Lake Views From Every Room! 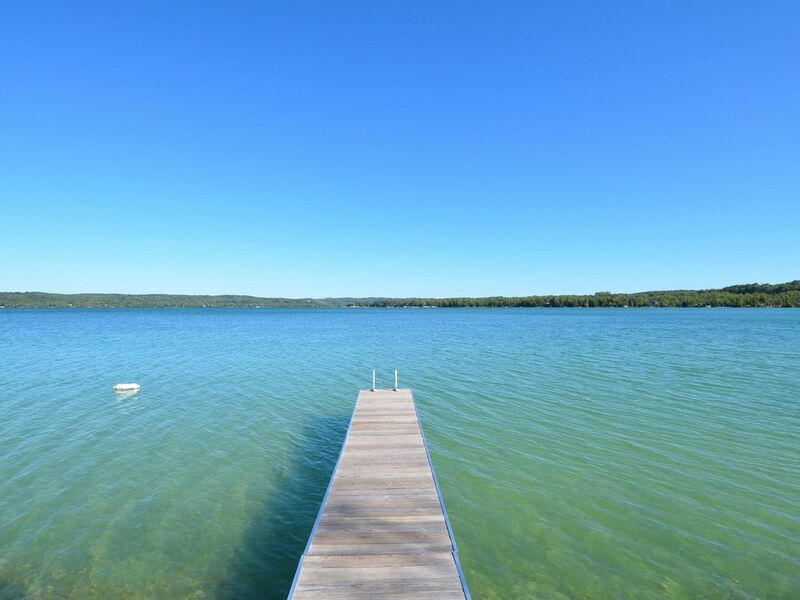 Gorgeous views of North Lake Leelanau greet you from every room in this bright and inviting vacation home. 'North Manitou' feels like home with a cozy living room and lake view from every window. Each bedroom has it's own sliding door out to a private balcony or deck area with seating. Enjoy the sunrise and your morning coffee from the house deck or stroll down the hillside steps and across the street to 200 feet on the lake. Dock your boat - or rent one! - for 18 miles of Lake Leelanau water sport fun! 'North Manitou' has a large lawn for family fun and games. The fire pit area is great for s'mores & sunset watching. Meals are easy in the full kitchen, on the grill - or in the village! This retreat is a year around getaway that will always make you feel at home. Do you have a larger group? Contact us for details on also renting the attached 1000 square foot one king bedroom/full kitchen & living/one bath apartment that is available for rental with the house or separately to accommodate two more people. The apartment - the 'South Manitou' - Listing #508885 can be opened up to the house or locked off for privacy. It has a private entrance, parking, patio, balcony & dock. We fell in love with the Leland area and knew that we wanted to share our interest in the area with others. We enjoy hiking, skiing, and relaxing by the fire. Rebecca is a wonderful host. The home was spotless and very well appointed. You couldn't ask for a better location nestled in the middle of wine country, amazing coffee and scenic views. Not one negative to be found. The home is very comfortable. Almost to the point where we didn't want to leave for our wine tastings! We loved the deck and the fire pit....the cozy living room for evening games and the balconies from each bedroom! The host accommodated our early check in and late check out, which was super helpful and much appreciated. The only bad review I have is that the driveway is a bit terrifying, super steep and uneven. Fix that and you've got a phenomenal property! Our family had a great time at the property. Nice fire pit, has a beautiful deck. One downside was the crossing the road to get to the water. This house is not as represented from the picture and website. First it is not one house but a house broken into 3 units. From the site and picture you are led to believe it is on the water. It is not. The main Hwy separates the house from the lake. You have to cross the Hwy. to get the dock which is not yours exclusively to use but rather a shared dock which is first come first serve. The house is rather run down and not well equipped. No dishwasher and literally a big square open hole in the kitchen cabinet which they slipped a trash can into. Looks lovely from the picture but beware. Very disappointed. Thank you for taking the time to write a review. After our guests stay we look forward to hearing about their time spent at our house enjoying family, friends, and all that the area has to offer. Sadly this is not a review we have ever received or were expecting. Using photos and descriptions we have tried our best to give a very honest representation of our home and it's surroundings. This is a two story home with an attached apartment above the garage. Because of this configuration, it allows us to have guests rent the entire house or either half to best accommodate their group size. When two separate groups stay the only area they would potentially share space is down by the water. We do have two separate docks and two areas to sit. The house has been rented this way for years with out any issues. Everyone has been more than respectful and understanding. We feel fortunate to sit on Whaleback Hill along Scenic M-22. Yes, you do have to cross the street, but it is a street that takes you on a tour through beautiful lakes, orchards, and old family farms. People drive from all over the country to visit. Guests have called to inquire about the location and crossing the street so I do believe the description and map on VRBO are explanatory. We are always here to answer questions and advise guests if we are a good fit for their needs. Crossing the street is not always in the best interest of the guests and we would rather have happy guests in the area even if that means they do not stay with us. The lack of a dishwasher in particular is a luxury that we are not able to have. Many homes in northern Michigan with well water do not have one. We do not list this as an amenity on VRBO but are prepared if it ever changes and we can get one in the future. We appreciate all reviews and feedback. Thank you again for taking the time to let us know your thoughts. We loved our week long stay at this Lake Leelanau retreat. The house is spacious, clean and well appointed. We loved sitting out on the deck for cocktails every night. The beds were very comfortable and the decor was charming. It's very close to Leland and Suttons Bay. Rebecca was a delight to work with - she was very helpful with any question we had. The home has a beautiful view of Lake Leelanau and the yard is huge and well maintained. Our only minor complaints were the highway noise and no dishwasher. However, I can highly recommend this home. This home is a great rental that we've stayed at many times. The kitchen has everything you need to cook if you'd like, although we love to visit the Riverside Inn in Leland :-) The bedrooms are lovely and the view is amazing! It's not far from Leland and a short drive to local wineries and shops. I highly recommend it.